​David Boyd’s book is a valuable and original addition to the recent bookshelf of Nicholson literature. It is, writes the author in his introduction, “an attempt to tread a tightrope between academic rigour and general interest, between reference reading for a purpose and leisure browsing…” It is, therefore, not a straightforward biography, a task which would in any case have been complicated by the publication of Kathleen Jones’ biography of Nicholson at the end of 2013 when Boyd’s book was already well under way. This is instead a critical biography, a work which places as much emphasis on evaluation of Nicholson’s work as on telling the story of his life. As if to underline his purpose, Boyd avoids the chronological approach, preferring to divide his book into topics rather than decades – novels, plays, topographical works, Nicholson’s family and influences, etc. One immediate benefit of this is that Nicholson’s non-poetic writing is given a welcome place in the spotlight; indeed some readers might be surprised if not slightly annoyed that discussion of Nicholson’s poetry does not arrive until the very last chapter. No matter, Boyd packs his writing with so much information and insight that nothing seems diversionary even if the main substance of Nicholson’s literary reputation is largely kept out of sight until chapter 13 out of 13. His own view is nailed prominently to the mast right at the start: “the best poet laureate that Britain never had.” Yet, surprisingly in view of this endorsement, Boyd is thereafter somewhat restrained in his appreciation of Nicholson the poet, preferring to act as orchestrator of a discussion by critics and fellow poets including FR Leavis, Queenie Leavis and AL Rowse, none whom found much merit in the poems, Anne Ridler, Matt Simpson and David Gascoyne who made no secret of their admiration, and TS Eliot who was somewhere in the midstream. Philip Larkin’s role as Nicholson’s nemesis, omitting him from the Oxford Book of 20th Century English Verse, is discussed with reference to correspondence from both men. Whether it is correct to rank Private Eye among the negative voices is another matter. Boyd reports the Eye’s comments when Nicholson and the Northumbrian Basil Bunting were among the names being floated as potential successors to Sir John Betjeman as poet laureate: “ruled out by reason of their remoteness from the Metropolis/Home Counties,” a view described as demeaning by Boyd when, like much of that publication’s output, it surely had more than a ring of truth. Boyd sees the magazine’s description of Nicholson as “a generously whiskered smock-clad peasant” as the price to be paid for operating as a provincial poet, but in reality this seems more typical of Private Eye’s method of ridiculing the very people who hold such views than an intended criticism. It is a thoroughly-researched book but nevertheless it contains a fair amount of speculation. To some extent this is inevitable given Nicholson’s secretive nature when it came to matters close to home. The book is written in a disarmingly self-deprecating style by a knowledgeable critic who has studied the whole of the Nicholson oeuvre. As Andrew Gibson, research professor at Royal Holloway University of London writes: “In the present state of Nicholson studies, no-one can simply ignore Boyd and his biography”. 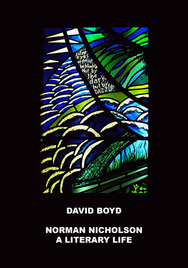 Norman Nicholson: A Literary Life by David Boyd, published by Seascale Press at £11.99. Available from Seascale Press, Richmond House, Drigg Road, Seascale, Cumbria CA20 1NS.